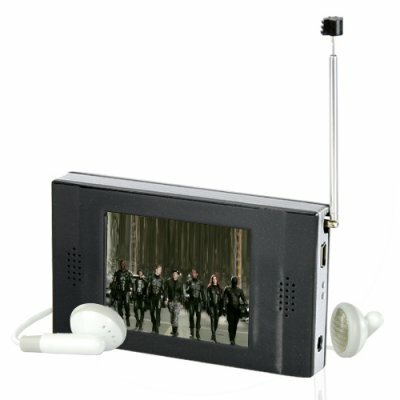 Successfully Added World's Smallest Portable DVB-T Digital TV (2.4 Inch) to your Shopping Cart. World's Smallest Portable DVB-T Digital TV (2.4 Inch) with a vivid touch screen LCD, radio function, channel manager and EPG functions. Watch television like never before! If you love television, be prepared to be able to finally enjoy TV no matter where you are! This new hot item gives you a crystal clear digital image for the best possible viewing while on the go. The CVEF-E15 comes with a variety of user function controls to allow you (the user) to manually adjust the display screen to suit your viewing needs. Its unique dimensions being just 90 x 52 x 14 (mm) makes this model smaller than a mobile phone. All over the world, millions of people commute on trains and buses every day. If you are one of them, then why not use this ultra portable digital TV to keep up with newscasts and weather reports or just simply enjoy watching your favorite football team. With the CVEF-E15 you never have to miss any of the action. The world's smallest portable DVB-T digital TV is now in stock, and available to you straight from the leader in direct wholesale electronics, Chinavasion. Note: This product only supports DVB-T format and therefore will not work in North America. This product receives MPEG-2 encoded DVB-T signals. Please check whether your region's digital TV broadcasts are MPEG-2 type instead of MPEG-4 before purchasing this product. Does this product come with a stylus pen? No, the touch screen interface responds quickly and accurately, a stylus pen will only slow you down. Will this digital TV work in the USA? No, USA digital frequencies are broadcasted in the ATSC format and not DVB-T.